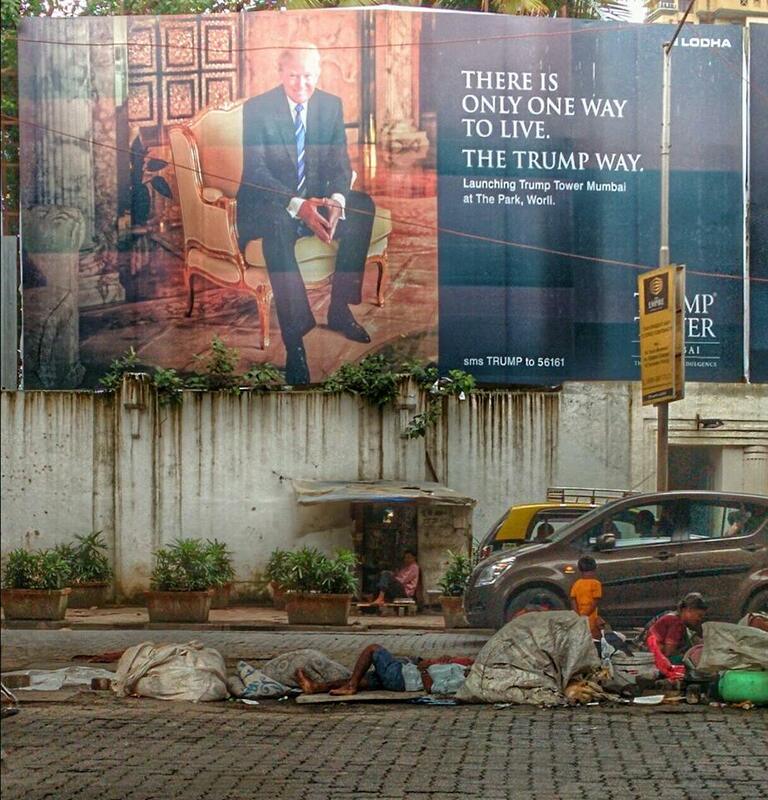 This photo taken in Mumbai, India is worth far more than a thousand words. And it is extremely timely, as well. Then, only hours later his press secretary gave a five minute press statement again attacking and denouncing the press while repeating the BLOTUS lies. Naturally, none of the press were allowed to ask questions. The Trump Way is to lie about the lies he lied only hours or days earlier. He castigates the press because facts are not his friends. I stand with the press. We must not give in to the bullying and intimidation of BLOTUS. We must not tolerate the “gaslighting.” We all must hold him accountable for ever lie he spews forth, large or small. The Trump Way is the way of dictators and despots throughout history. But, it is not the American way. And it’s certainly not my way. This entry was posted in Hunger & Poverty, News & Views and tagged accountability, BLOTUS, bullying, businesses, CIA, conflicts of interest, despots, dictators, egocentric, facts, friends, gaslighting, hunger, India, intimidation, Langley, lies, lifestyle, Mumbai, poverty, press, the Trump way, Trump, Virginia on January 22, 2017 by Ray Buchanan. 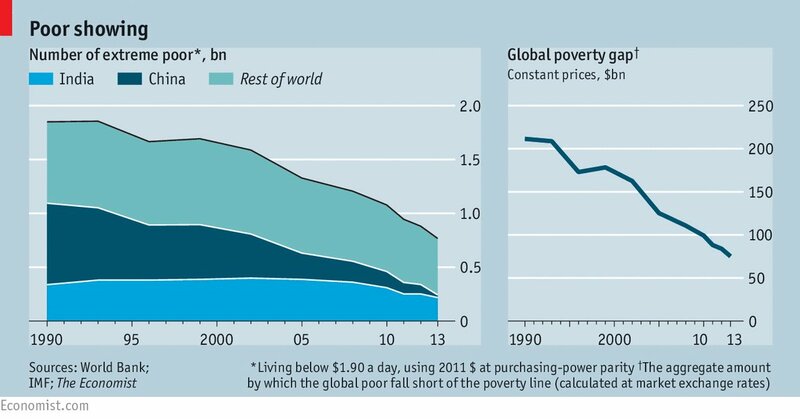 The numbers of extremely poor continue to drop around the globe. Working together, we are changing the world. The chart pictured above illustrates the good news. The Millennium Development Goals (from 2000 -2015), and now the Sustainable Development Goals (2016-2030), are working, and working well. We are on track to end hunger by 2030. Let’s continue striving to make it happen. Working together we can achieve a world without hunger, and we can do it in our lifetime. This entry was posted in Facts & Statistics, Hunger & Poverty, News & Views and tagged China, ending hunger in our lifetime, global poverty gap, hunger, IMF, India, Millennium Development Goals, poverty, sustainable development goals, The Economist, World Bank on October 27, 2016 by Ray Buchanan. A brief, yet powerful sermon we all need to heed. Having just returned from a trip that included both India and Nicaragua, this resonates with me more than ever. We all need to stop being so sensitive to personal affronts and far more sensitive to the real pain, greed, and injustice that fills the world. This entry was posted in Hunger & Poverty, Quotes, Spirituality & Religious Writings and tagged affection, art, Celtic, Christian, Facebook, greed, hunger, India, injustice, Nicaragua, offensive, pain, poverty, sensitive, sermon, travel, war, wealth, world on October 23, 2016 by Ray Buchanan. I left Bangalore, India on Monday morning a little after 4:00 after a full day and evening of events. After a mind-numbing flight through Dubai and Houston, Texas, I arrived in Managua, Nicaragua Tuesday night sometime after 8:00. I finally got to my hotel around 9:00 or so. A driver picked me up Tuesday morning at 5:30 for the three hour drive up to Matagalpa where I met the Fill the Bowls team. We spent the day visiting two schools we support. Since this is the rainy season, we were soaked by the time we got back into the city around 4:30 when we all agreed it was time for a late lunch/early dinner. It was a fantastic day and again demonstrated to me the immense power that is generated when we all work together. Fill the Bowls is changing the lives of hundreds of children in the four villages where we are working. For me, this is a special trip. First, I am back in Nicaragua. Nica is the first country I visited when I started Stop Hunger Now. That trip was in January 1998. Another reason for this trip being so meaningful for me is that I am here as a board member of Fill the Bowls, a nonprofit organization founded and directed by Chessney Barrick, a close and very dear friend, and a former member of the Stop Hunger Now staff. Seeing the excellent work being done by Chessney and Fill the Bowls is just one more affirmation that we can make a real difference. Working together, we are helping to end hunger in Nicaragua. I am back where it all started still working to end hunger in our lifetime. Life is good. This entry was posted in Hunger & Poverty, News & Views, Travel Tales and tagged Bangalore, Chessney Barrick, children, Dubai, Fill the Bowls, friendship, Houston, hunger, India, Managua, Matagalpa, Nicaragua, poverty, schools, Stop Hunger Now, Texas, villages on October 21, 2016 by Ray Buchanan. I arrived here in Bangalore, India sometime after midnight this morning. By the time I had gone through immigration, picked up my duffle bag, cleared customs and exchanged some dollars into rupees, it was after 1 am. The Palms, where I normally stay in Bangalore was full so my excellent staff booked me into the Taj Bangalore Airport. Since the Taj was less than a 10 minute walk that’s what I did. Even after one in the morning the heat and humidity had me breaking a sweat before I got to the hotel. The staff was as courteous and friendly as I expected, and I got to my room around 2 am. After a hot shower, I still couldn’t get to sleep so I read until after 3 am. Later today I hope to meet with Stop Hunger Now India’s director. Dola is a dedicated, passionate leader in the fight to end hunger, and I am really looking forward to some time with him. Tomorrow I am to make a brief presentation at an event hosted by J.P. Morgan Bank, where I get the honor of thanking them for their continued generous support of our efforts to end hunger in our lifetime. And at 4:30 am on Tuesday, I catch a flight to Managua, Nicaragua. Once there I will switch hats, and represent the board for Fill the Bowls, another life-changing nonprofit. I’ll admit that the schedule is a little rough, but I wouldn’t change a thing. This is just too much fun. This entry was posted in Hunger & Poverty, News & Views, Travel Tales and tagged Bangalore, Fill the Bowls, fun, hunger, India, J.P. Morgan, life-changing nonprofits, Managua, Nicaragua, Stop Hunger Now, Taj, travel on October 16, 2016 by Ray Buchanan. As an immediate response to this emergency situation, Stop Hunger Now India, in partnership with Treasure Life Foundation, Hope Foundation and Rural Relief Network/SAARP (as well as few other local NGOs and civic groups) has provided nearly 150,000 meals to over 5,000 families in Chennai and Cuddalore areas, including the cut-off pockets in rural Panchayats. As you may have been seeing the news items across the TV channels, the situation is quite grave and we have been receiving SOS requests from a number of local groups. The field teams responding to the current situation have requested immediate help for food packets, medical supplies, clothes etc. We are gearing up to send 300,000meals for the affected families. We also have received requests for mats, tarpaulins, water-filters, tents and bed sheets, water containers, warm clothes, school supplies for children etc. We have a warehouse in Bangalore where these materials are being collected and the field team will be able to pick up all these once a truck load of materials are gathered. This entry was posted in Facts & Statistics, Hunger & Poverty, News & Views and tagged Chennai, crisis, Dola Mohapatra, emergency, flooding, India, medicine, partnership, relief, Stop Hunger Now on December 10, 2015 by Ray Buchanan.